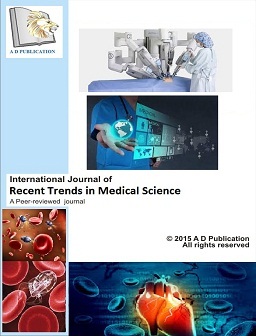 International Journal of Recent Trends in Medical Science (IJMS) is peer- reviewed (refereed) international journal published by A D Publication. Its aim to provide the most complete and reliable source of information on current and futuristic research in Medical Science. It is a leading e-journal, under which we are encouraging and exploring newer ideas of current trends in Medical Science by publishing papers containing pure knowledge. The Journal is started with noble effort to help the researchers in their work and also to share knowledge and research ideas. The Journal also includes specifics on new instruments and diagnostic equipment, as well as modern therapeutic drugs and devices. Professor and Head, Microbiology Department,Government Medical College, Rajnandgaon , Chhattisgarh, India. Assistant Professor, Department of Medical Research SRM Medical college Hospital and Research Centre, SRM University, Kattankulathur - 603 203, Tamilnadu, India.